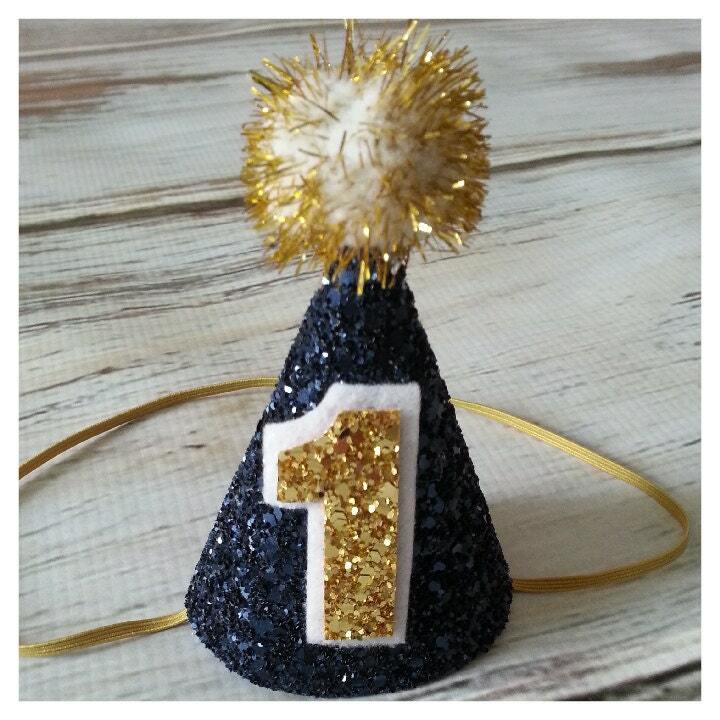 Shown is our mini party hat with Navy Blue Metallic glitter fabric and double layered white and metallic gold glitter fabric number 1 with a gold and white sparkle pom pom on a gold elastic headband. Birthday Hat can be customized in many different colors. .just send us a message and let me know what you are looking for. Mandy is the best! Her designs are always beautiful! Love her shop! I love the packaging. Look forward to ordering again in the future. This hat is adorable! I love it!! It is made with such care and the materials used are high quality. So super cute, and amazing quality work!! Well for anyone who is like me I read the title of the name and assume that this is a party hat for a 1yr old boy but that is not the case. This may be a party hat for a finger of a 1yr old as it is super tiny but it isn't meant for the head of a 1yr old. I guess this is my bad for not reading all the details, which is where it finally says the word tiny, but why would somebody want a hat smaller than a 1yr old's finger for a smash cake party hat, ridiculous!! To top it off it says it's a custom order so no refunds but yet it's ready to ship when you order it, hmm something doesn't seem right there. This would be cute if I wanted this for a shopkin size doll but not my one year old. Very disappointed especially for the price, I was able to make a new hat for around $6.